I've really gotten behind on these entries. Since the last entry I have flown three solo flights and a dual lesson. 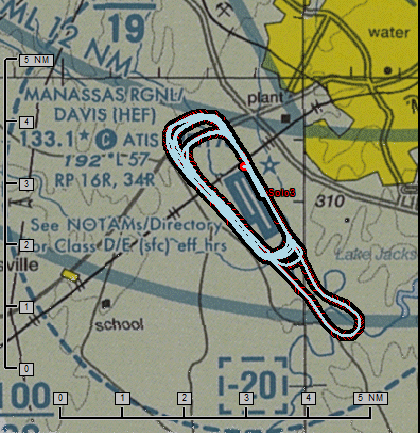 On Saturday, September 11th I flew my first unsupervised solo in the Manassas traffic pattern. Once one of the instructors had verified that the weather conditions were within the school's limits, the dispatcher just handed me the keys to the airplane. I'll admit that this flight was a little bit unnerving, because the dispatcher changed airplanes an hour beforehand to one that I had never flown, a 1979 Cessna 172N. Suffice it to say that in my nervousness, I performed a very thorough preflight inspection. I was surprised to find that she handled quite a bit differently than her slightly younger sisters: the rudder trim was such that I needed almost no right rudder to hold the extended runway centerline on takeoff. I had one really good landing out of the 5 attempts. In a couple of cases, I let the mains touch with too much airspeed, so I needed to fine tune my landing flare. I managed not to bend anything on the airplane, though. Last Thursday, Sept 16th, I flew lesson #14 (out of sequence--the school likes a dual lesson before the practice area solo). The focus of the lesson was attitude instrument flying. I did a lousy job of tracking Casanova VORTAC under the hood. Unusual attitude recovery was fun. The instructor asked me to put my head down while he attempted to disorient me by rolling the wings and pitching up and down. He then put the plane in a banked climb or dive, and I had to recover using instrument references only. 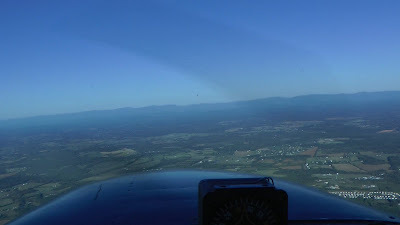 The landing at Culpeper was not great--I am a little frustrated with my ability to land the airplane smoothly at this point. I haven't made any dangerous mistakes, but I think I should be making consistently better landings by now. On Sunday, Sept 19th, I attempted to make my first solo out in the practice area. Unfortunately, the mist/fog at Culpeper hadn't burned off yet, and so the chief flight instructor cleared me only to stay in the pattern. I got 6 takeoffs/landings in the hour (lots of other airplanes out on such a beautiful day). I tried flying a tighter traffic pattern to be courteous. This required a steep descent on final approach using idle power and full flaps early on. The landings weren't terrible, which is about all I will say. I was nowhere near as nervous as Solo #2, though. In one circuit, I had been cleared to land on runway 34L and had just pulled the power back and added 10 degrees of flaps. 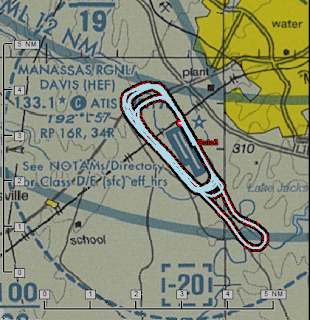 Just as I was going to turn base, Manassas Tower asked me to extend my downwind, then later canceled my clearance to land. So I added power, retracted flaps, and kept flying on. In retrospect, I probably should have kept the flaps down and entered slow flight, because that was a long, crooked final approach. 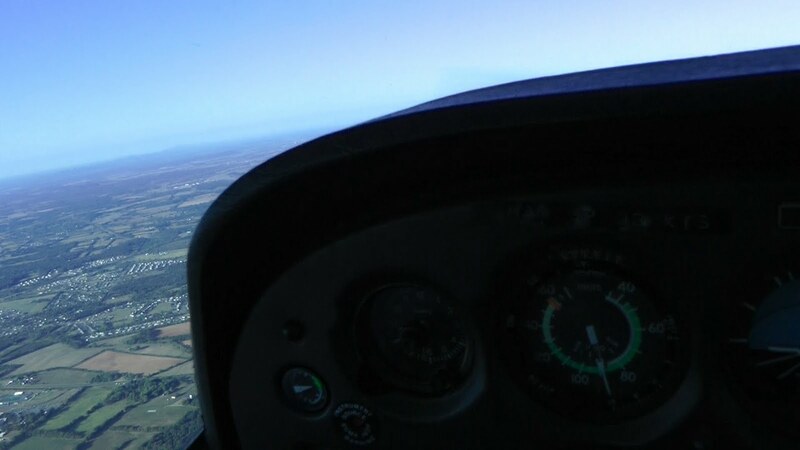 Tuesday, 21 September, I flew my first solo out into the practice area. The visibility was unrestricted, sky clear, winds calm. I took my time doing the preflight check again. I couldn't quite touch gas in the left tank, though the gauge read 3/4 full. So I called for gas just to be safe. There was about 5 1/4 quarts of oil based on the dipstick, so I called for another quart--overkill, I know, but I just didn't want to have to think about it. Air temperature was in the 50's, and I noticed that the engine would cut off if I closed the throttle completely. After the run up, the engine ran run rough at idle--as is usual for this particular airplane--but it didn't quit. So I pressed on. She climbed like crazy on takeoff, solo in the chilly morning air. 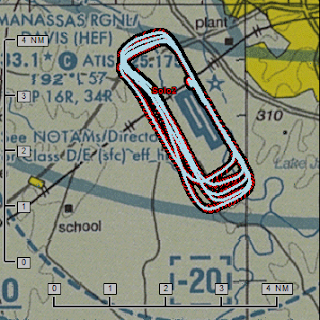 I did my best not to get lost and not to bust the Dulles Class B airspace or SFRA. I was successful with those goals, though Potomac Approach seemed irritated that I called them on 124.65 (my assigned departure frequency) instead of 127.32 MHz on the way back into the SFRA. To make matters worse, I forgot to switch between radios and called twice on the wrong frequency. I dropped a wing slightly during the power-on stall (it was really a cool feeling to do that solo) and my heading control was a little sloppy. I also didn't track the Casanova VORTAC very well on the way out. 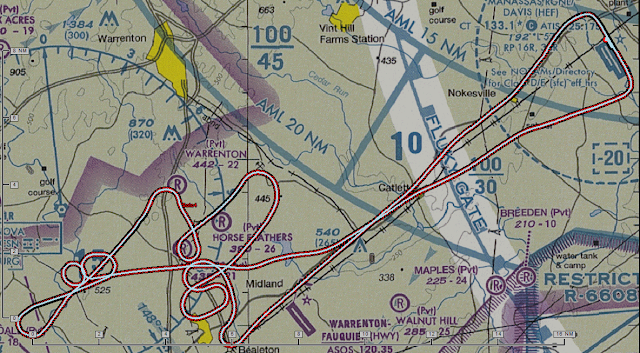 I was so concerned with getting lost, that I stuck close between Culpeper and Warrenton for the maneuvers. 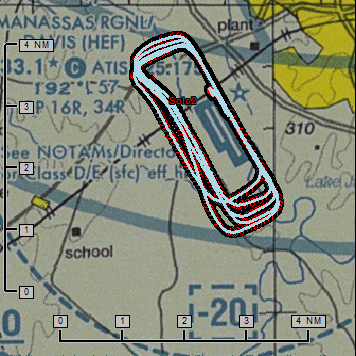 Next time, I will move further from Warrenton, because there was a lot of traffic around me and I could hear Potomac TRACON calling me out (unidentified, since I was squawking 1200 at this point) to other airplanes. Next time I will be more courteous and work a little further to the west. I followed the railroad tracks back to Manassas, and my landing was not great: I let the main wheels touch with too much airspeed, causing a bounce. I recovered fine, keeping a nose-high attitude and adding a little power to touch softly, but it was still ugly. I need to start the flare sooner.